Find hotel near Charlottetown Farmers Mar .. Whether it’s organic tortillas or delicious, fresh salmon, find it all at the charming Charlottetown Farmers Market. There are local musicians and other entertainment that adds to the lively ambiance of the market. Local vendors and farmers sell their freshest produce here, making it an extremely popular event for locals. Enjoy the warm atmosphere in the heart of the community. Meet local farmers, craft & food artisans and producers. Purchase locally grown organic produce, fish, meats, baked goods, preserves, locally roasted organic coffee and speciality teas. Travel by cab to reach this destination. How popular is Charlottetown Farmers Market? 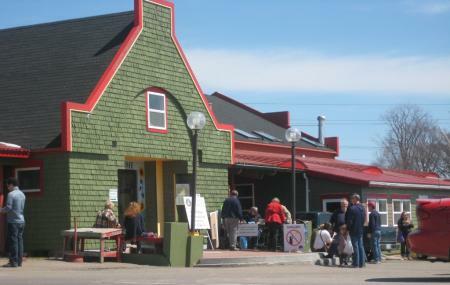 People normally club together Charlottetown Founders Hall and The Mack while planning their visit to Charlottetown Farmers Market. Great place to get island produced items. From produce to meats to hand crafted goods, the local businesses shine in what they sell. Would recommend both for a visitor to the island and long time locals. Depends on why you're going. Its cramped and busy. However, it's an amazing opportunity to get out there and meet the people working so tirelessly to put food on our tables. I enjoy it every single time I go. Amazing site to visit. I'm here almost every Saturday. Love the atmosphere here. So sweet. An interesting little market. We drove from Cavendish during our vacation to check it out. Much smaller than I expected. We bought the mulberry liquor - delicious! I also bought some loose leaf tea. There is an ATM here, washrooms, and ample parking. The round-about to enter was a little confusing.